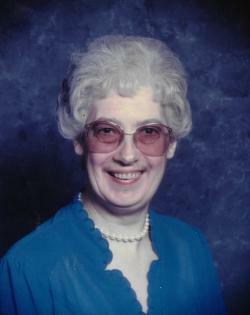 Erma Cook of Wheaton Settlement passed away on Saturday, April 13, 2019 at The Moncton Hospital. Born in Meadow, Albert County, she was the daughter of the late Herman and Bertha (Wilson) Steeves. She was a retired telephone operator, a member of First North River Baptist Church and a member of The Annabel Gay Women’s Institute. She will be sadly missed her daughter, Sharon Crossman (Richard) of Wheaton Settlement, sisters: Frances Miller of Calgary, AB, and Rita Geldart (Arnold) of Hillside, a brother, Art Steeves of Salisbury, NB, a grandson, Aaron Crossman and several nieces and nephews. Besides her parents, she was predeceased by her first husband, Gordon Bishop, second husband, Reginald Cook, brother-in-law, Harold Miller and sister-in-law, Barb Steeves. The family will be receiving friends and relatives at Cobb’s Funeral Home and Cremation Center, 330 Whitepine Road, Riverview (869-2007) on Monday, April 15, 2019 from 6:00pm to 8:00pm, with funeral service will take place from Cobb’s Funeral Home on Tuesday at 2:00pm with Rev. Wayne Hagerman officiating, with the interment to follow at Wheaton Settlement Cemetery at a later date. Donations to the Wheaton Settlement Cemetery would be appreciated by the family.